Well, not exactly an official BarRun since there was no official invitation for the BarFlies to come run. Still, we have a tiny handful running. That's KingMeng and his aunt on the left and the Yum Yum Long Legs Aloe between the two guys. Airpork as chio as I last saw her like what? 4 years ago, went off running with her colleagues. Still, it was nice to be able to say hi before we ran our separate ways. 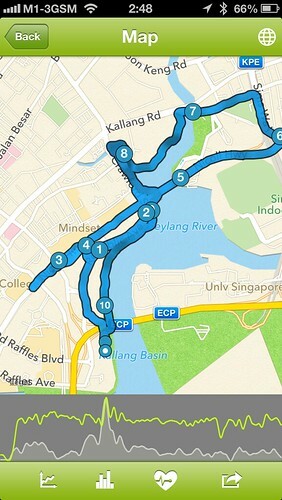 My timing of 1hr 18mins was a mixed bag of feelings. On one hand, I was glad that I managed to finish the run in a single puff, and very comfortably if I may add, despite laying off training for an entire month due to my work relocation. I took a lesson from running veteran Adrian from RunForFunds as I made sure I taped up my 4th toe and my left arch, before putting on two layers of socks. Result? 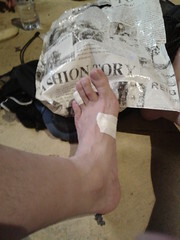 No blister at all and I finished the run comfortably. 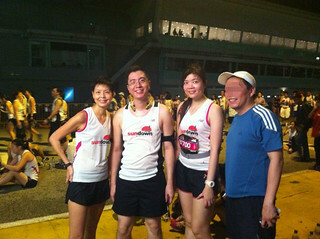 Surprisingly, there was no aching or soreness after the run sans a tightness at the back of my right knee. On the other hand, I was disappointed as I have been training since December last year and was close to cracking the 60-minute mark only to be disrupted and have everything undone is just mere 4 weeks. As I ran, my confidence took a big hit as I now contemplate switching down to 10K instead of the 21K for StanChart, at year end, as originally planned. Thoughts on this run? I am not particularly happy with the route as there were a couple of bottle necks along the way jamming up route. I won't complain about the start-of-race traffic jam as that happens to every run. It was inevitable. So that still makes the Real Run as my favourite run so far. The worst has got to be the Mizuno Wave Run. Incompetent organisation and coordination. Hope they are better now but it is irrelevant to me now that it has been struck off my list of runs to participate. Anyway, I ran with the Wahoo BlueHR Bluetooth 4.0 Heart Rate Monitor and am happy to report that the HRM worked perfectly throughout the entire 10K. I would certainly recommend this to all my friends. Below are the screen caps of my run tracked by Endomondo, which I probably would review this genre of software in another entry sometime in the near future. There was a slight discrepancy due to the gun time and nett time different. This to due to the sheer number of people at the starting point that it took me three minutes just to get to the starting line after the gun had gone off. The first indication of fitness, or rather the lack of, is the timing as I clocked less-than satisfactory time. Still, when it comes to timing, several factors come into play and human traffic jam is perhaps to biggest delay of them all. The other and more important factor was my average heart rate. 172 bpm is really working the ticker really really hard. On a good day, i.e. 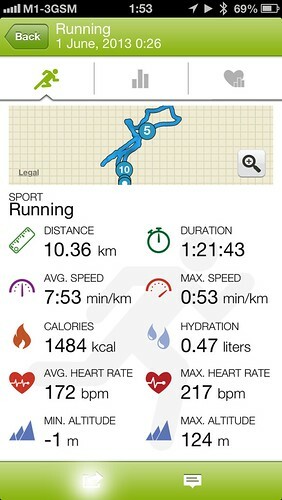 regular running and in good fitness state, my average heart rate on a 10K run is around 150 to 160 bpm. The maximum heart rate of 217 was just a one-off jump during the final sprint approaching the finishing line. Here are the rest of the race details below. wah, someone pui liao, got belly somemore..
Gary: Yeah. 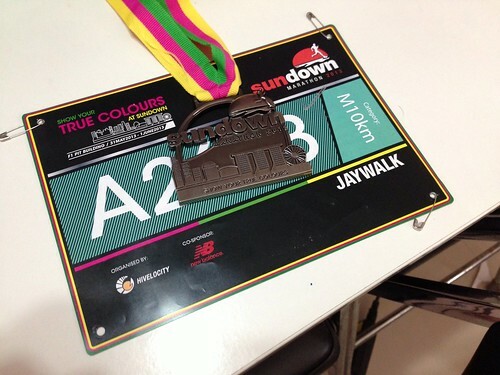 Hopefully, can get back to normal as I begin training for StanChart or even Shanghai Marathon in between.